In this post we will learn how to trade the short ratio call spread. This strategy is traded when a trader has a range-bound view on the stock, but feels that the volatility will decrease in the near future. 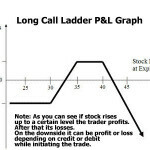 Note: Refer my article on long call ladder. You will see that in the long call ladder a trader buys one ITM call option and sell one ATM call option and another OTM call option. 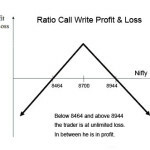 So what is the difference between long call ladder and the short call ratio trade? The difference is the credit received and risk in the trade. While in the short ratio call spread the credit received is more, in the long call ladder the credit received is less. Risk is also more in this strategy than the long call ladder because the shorted options are near the money. Lets now trade Short Ratio Call Spread using real premiums. Please note that on the day I was writing this article (23-Feb-2015), VIX was on the higher end so you are seeing such high premiums for at the money options. You may get slightly lower premium when you trade. The higher premium is also due to Budget 2015 which will be declared end of this week. Lets now trade this using the above premiums. To make math simple we trade 100 shares. Note: If you do not go far or deep out of the money, ideally you should get a credit. But risk will also increase. Remember if Nifty keeps going up, this trade will have unlimited loss. So the selection of the strike to short is VERY CRITICAL to the success of this trade. On the one hand, if you sell the nearest OTM option, you get a large credit, but your risk on the upside is very close. On the other hand, if you go deep out of the money and sell options far away then you may not get a credit and may have to pay cash to trade this. In this case the risk reduces, but reward also decreases. So Which Strike To Sell? If you sell options very close out of the money, you are actually taking a bear call. Like in the example above. 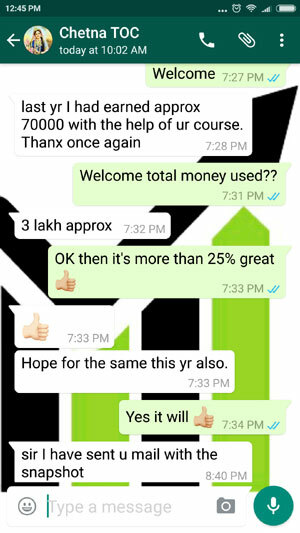 The trader has got a large credit – so he will be happy if Nifty falls. If you sell options far out of the money, you are taking a slightly bullish call. Since you paid money to trade you want to profit from both the bought options (for that Nifty has to rise), and the sold options (for that Nifty cannot travel far up). So you would want Nifty to go up slowly. Therefore I suggest you sell options that far so that you pay a very small amount or get a small credit. This will balance out the bear and bull view and be correct with the strategies view which is range-bound with fall in volatility. a) Nifty does not move: Its OK. If the trader took a credit while initiating this trade, he can keep the credit as profits. Or if he paid a small amount the loss is negligible. b) Nifty goes up: Since the sold calls are still some distance away, chances are that Nifty will take some time to reach the short strike. Now Theta will do its job and take premium away from the sold options. Of course the bought options that are in the money having higher intrinsic value may still be making money. On top of that the decreasing volatility will also eat some premium from the sold options. 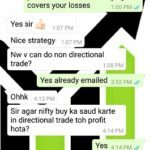 The trader can exit as soon as Nifty reaches the sold options in profit. c) Nifty falls: In that case the trader can keep the small credit that he got while initiating this trade. If there was a small debit, that is also fine. I did not go very far to help you understand the strategy. When you trade take your own call. This trade has maximum profits when the stock is exactly at the sold option strike on the expiry day. Of course if this happens before expiry, then the trade may be in loss or profit depending on volatility. If volatility dropped significantly, the trade may be in profit. If it increased then the trade may be in loss. It is advisable to take a stop loss when the stock reaches the shorted call option strike as potentially the losses are unlimited if the stock keeps traveling north. Passage of time and decreasing volatility helps this trade. Important note: Just to get a large credit please do not sell more options than what is described in this trade. You should only sell double or less number of lots of options than the lots of options bought. If you succeeded trading this once you may get overconfident and sell more options – this is where you may get in trouble. All options expire worthless. The trader can keep Rs. 16,000.00 or whatever the credit he got while initiating this trade. Note that anything below the results will be same. Rs. 13,500 is blocked to sell one lot or 25 shares of Nifty. We sold 200 shares. So total lots sold = 200/25 = 8 * 13500 = Rs. 1,08,000 blocked as margin. 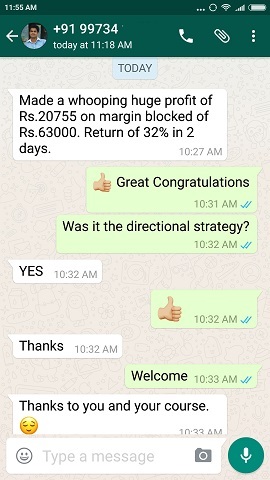 Rs 26,600.00 was blocked for buying 100 shares of 8700 strike call option. This is a very good return in 30 days. The sold options expire worthless. This is amazing return in 30 days. This is a good return in 30 days. And virtually since Nifty can move up to infinity – the loss on paper is unlimited. However we all know that somewhere the trader will take stop loss. Important: This is looking like a great trade as losses only begins after Nifty travels a considerable distance. But you do not know how fast it may happen. If it happens very fast you may lose a lot of money even if you take a stop loss a couple of 100 points away. And since a major event is coming this Saturday (stock markets will remain open like normal trading day), its not the right time to play this trade. If you want to, please let the Budget pass away. Also once the Budget is over, the premiums of the options will come down drastically because the volatility will crash. Due to this your break even will also get reduced and therefore short ratio call spread will become slightly more risky. If you chose your strike prices correctly and you are ready to take a stop loss, you can trade this strategy. 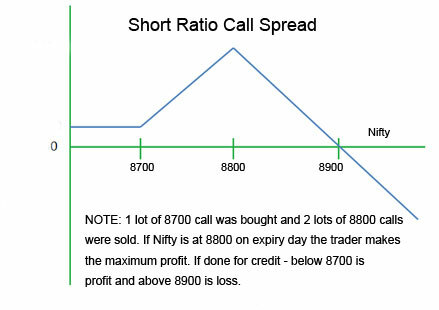 Short Ratio Call Spread is done by buying one in the money call option and selling double number of out of the money call option. Risk is unlimited, Reward is limited. It works best in a range-bound market and volatility dropping. You should take a stop loss when the break even is breached. You should have done your calculations before putting the trade. Do not trade when a major event is near. 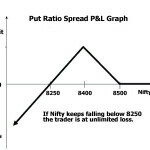 Let me know issues faced in short ratio call spread if you ever traded. Thank You Dilip Sir….for nice article. I agree 200% that do not trade when a major event is to happen in near future. Please illustrate Short strangle nifty call & put non-directional strategy with Delta Neutral adjustments at appropriate levels( after a gain or loss of-up/down points) for a constant gain of 3-5%monthly returns for the conservative traders. Thanking you very much sir. Delta neutral is not that easy as it sounds. A lot of trading is involved so a lot of brokerage also eats into the profits if any. On top of that the traders doing delta neutral are full time traders with large accounts. They have to constantly monitor delta. Most adjust for every 50 points movement of Nifty as Nifty strike prices are 50 points apart. You will also need a software to tell you exact Deltas of the positions Call and Put. Due to too much trading some traders resort to Delta Neural Automated Trading. Even after that there is no guarantee that a trader will make a profit. The real killer is Vega. For sellers Vega is enemy. Imagine adjusting positions when Vega has increased, the seller adjusts in a loss. 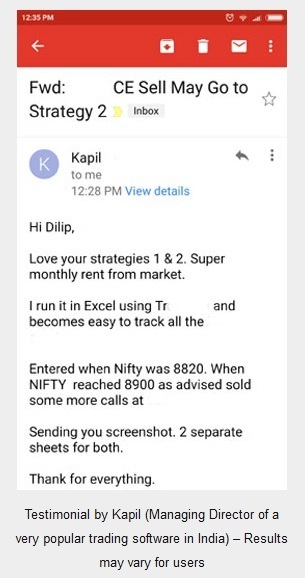 Imagine Nifty moving too much and the seller ends up paying too much to his broker. I have not even included the headaches adjusting positions almost everyday. Book keeping again is an issue. To avoid all this it is much better to trade simple, positional and hedged positions. That will take a lot of stress out of trading. Making 30% a year from conservation trading is not difficult at all. Thank you very much for your valuable suggestions for my request. The explanations of different strategies have been quite simple and easy to understand with basic logics as all of them have been substantiated with real life examples . 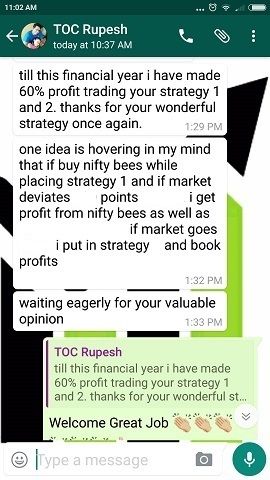 None of the Indian websites have been so simplistic and that to FREE in their approach towards Option strategies in public domain Would request if you could also explain in the most simplest way on Delta Neutral Strategy for your regular readers, with real life NIFTY eg . Delta Neutral Strategy is nothing but any strategy that needs adjustments when Delta changes on both sides. Since these needs a lot of changes and watching the trade when the markets are open, I am not quite fan of the Delta Neutral Strategies. But I have noted this and may be one day write an article on it.